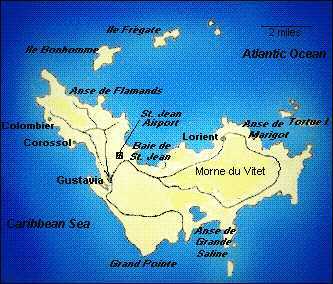 Saint Martin/Sint Maartin are the dual names of an island divided between the French and the Dutch. The boundary runs through Simpson Bay lagoon whose entrance is controlled by the Dutch at the Dutch bridge on the south and by the French at the French bridge on the north. If you are visiting, you will pay different duties depending on which country you are staying in. The Dutch have a particularly arcane set of offices and charges which have largely chased everyone to the French side. We really like the Marigot Bay and will stay there in the clean water unless northern swells chase us out. There are anchoring charges in the area controlled by the harbormaster in Marigot. The cheapest alternative is to stay in the Lagoon on the French side and check in at the Marina Royal (inside the lagoon in the north east corner. If you are visiting us here, tell customs you are staying on a private yacht "S/V Queen Emma which is anchored in the lagoon on the French side". It is unwise to be unclear about where you are staying. It is a lovely romp to the south west to reach St. Barths, one of the ritziest islands in the Caribbean. There the true yachties can be found enjoying the clear waters, beautiful beaches and world class restaurants. Meanwhile, their crews keep some of the livelier bistros of St. Martin in action. Their giant yachts are often based in St. Martin, which has all the services, and they take the clients to upscale St. Barts or Anguilla. St. Barts was discovered by Christopher Columbus in 1493, and he named it in honor of his brother Bartolomeo. In the mid-1600s, the French arrived, took control from the indigenous indians, and built small settlements. In 1784, it was sold (traded) to Sweden, and even though the French bought it back in 1878, some Swedish influences remain, including the name of the its capital, Gustavia. Although St Barths has recently become independant,, I lump it in with St. Martin because it is close by and the two are usually visited together. I believe St. Martin is still a part of the overseas department of Guadeloupe. The dual nationality structure of St. Martin tends to lead to a fair amount of neglectful governance and some amusing quirks of law and custom.